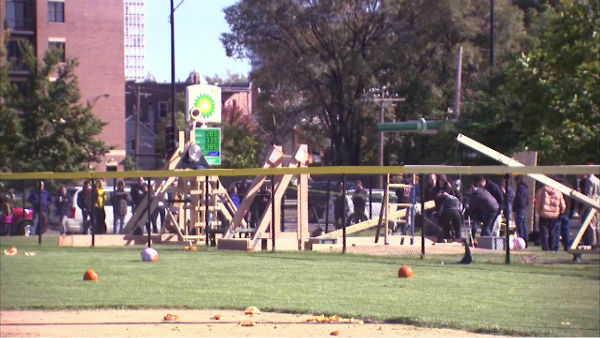 CHICAGO (WLS) -- Some people carve pumpkins, others catapult them. The Illinois Institute of Technology hosted its 11th annual pumpkin launch Saturday. Teams of students had to design and build devices to hurl pumpkins across a field. The Illinois Institute of Technology hosted its 11th annual pumpkin launch Saturday. The goal was to see just how far they could fling a pumpkin. The teams were also judge on accuracy and creativity. The Illinois Tech Robotics Mach 3 Team took first place with a distance of 227 feet, the Society of Physics Students SPS Team took first place for accuracy with 7 feet and the Alumni team Meow was awarded crowd favorite.